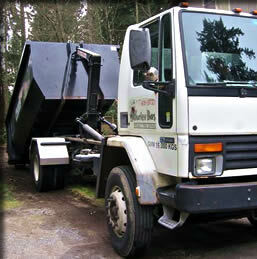 Burley Boys provides waste bin services focused on tree, brush, and other yard waste destined for recycling. Burley Boys Bins are designed for maximum efficiency in delivery, loading, pick-up, removal, and unloading resulting in minimum cost. What do you do with your yard waste when landscaping? If you are aware that yard waste can no longer be disposed of along with regular garbage, you’ll know that disposing of the waste can cost more then the job itself. 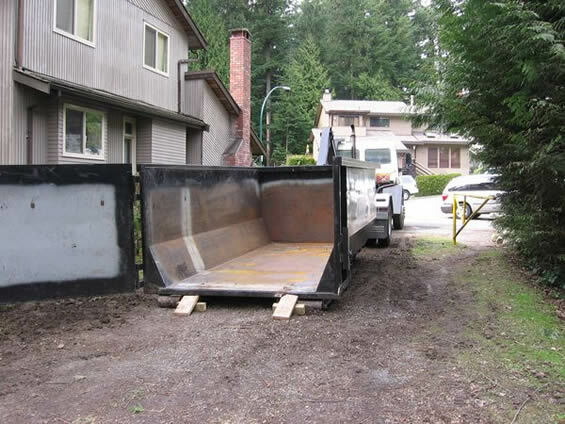 What major landscaping companies do is have bins placed around the work site that can be easily hauled away when the job is done. Now, you can have the same service. Bins delivered right to your work site that are the right size and perfectly designed for easy top or open-end loading. Bin service is increasing in popularity because of it’s economic and environmental advantages. Rather than piling up the waste only to have a loader and a truck pick it up and dispose of it later, the waste is put directly into the waste bin where it is quickly picked-up and hauled away later. Even if you are piling it directly into a truck for later disposal, you are tying up a truck that could otherwise be in service as well as tying up a driver who is being paid by the hour. It it far more efficient to have someone ‘drop-off a bin’ and ‘pick it up later’. In the same time that it takes to load a truck, a truck driver can be servicing others resulting in greater efficiency and reduced costs for all. Burley Boys Bins can accommodate up to 15.3 cubic meters (20 cubic yards) of green waste, or up to a maximum of 5.3 cubic meters (7 cubic yards) of dirt & rock. The photo above shows just how easy these bins are to load and unload and how easily these waste disposal bins can be put into places previously considered inaccessible. To book a waste bin delivery, CONTACT US.